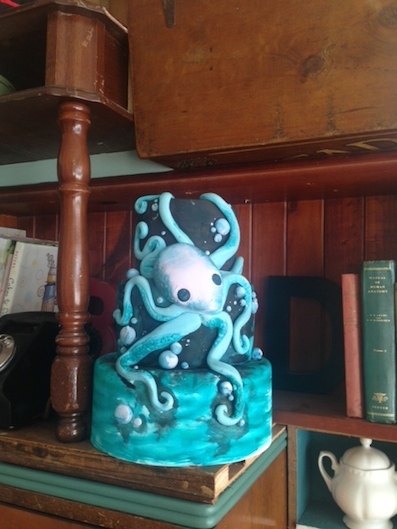 When I think about a wedding cake I think about multiple tiers, a lot of white frosting and perhaps some flowers or sweet hearts, I don't tend to think of a bluey, green octopus or even bleeding roses on the side of an otherwise typical cake. But it seems that my ideas are perhaps a bit too stereotypical for the likes of some of Bayside's more quirky, extrovert or simply creative and passionate residents. But thankfully for them Gina Tubb has arrived in McKinnon and is ready to craft a wedding or birthday cake to encompass the tastes of everyone. You see Gina has been baking for a long time now and she is very good, good enough to have worked for and supplied a number of Melbourne's most popular cafes like Hawk and Hunter, The Merchant Guild and Little Ox to name just a few. She is also that good at what she does that she spent a long time at the Edinburgh Castle in Scotland delighting them with her talents and creativity. But lucky for us she has returned home and set up a most darling little shop called Miss Ladybird Cakes at the busy end of McKinnon Road not far from the train station and a number of other small stores. The store is delightful and delicious. 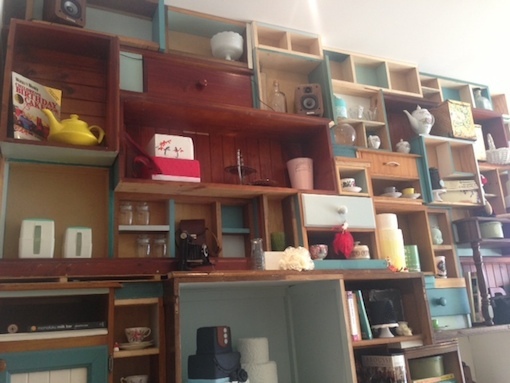 On one side is a gigantic structure combining old bric-a-brac and furniture in a jigsaw style making a fully functional and extraordinary wall unit. The closer you look the more you will observe like a draw, a cabinet and a side table slotted in perfectly together. Amongst it all sit the most beautiful and sometimes terrifying cakes I have even seen. This is an awesome piece of furniture or should I say awesome pieces of furniture! On the other side is a beautiful big window that allows you to gaze out onto the street and watch the world wander by whilst you hide away with a Nutella cupcake and a Brazilian coffee. Here you will find a quaint dressing table adorned with a feature cake and some gorgeous sweets. It is so pretty you feel like you should have worn a beehive in your hair and a floral frock to suit the occasion. At the counter Gina will win you over with delicious treats based on classics she loved when she was growing up, like musk sticks, coconut ice and fudge. Along with these is the daily selection of scrumptious cakes, friands and tempting biscuits. Pretty in Pink with 100's and 1000's on top! We ordered a coffee that came in a pot to share and was creamy and comforting and unlike normal expectations it was percolated not out of a massive coffee making machine. Having a reputation myself as making the worst coffee ever I was sceptical about the taste and nearly ordered tea instead but it was the perfect accompaniment to my Vanilla, Almond and Pear cake. Delicious coffee made in a peculator rather than a fancy big coffee machine. Miss Ladybird is an out of the ordinary find and mixes the quirky and eclectic with nostalgic favourites. 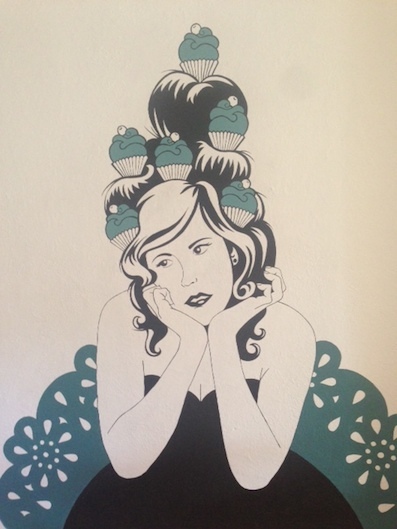 From the friendly and inviting staff to the glorious and gory cake displays, Gina will capture your imagination and taste buds with her passion, skill and ice cream sandwiches and doughnuts which are really spectacular. 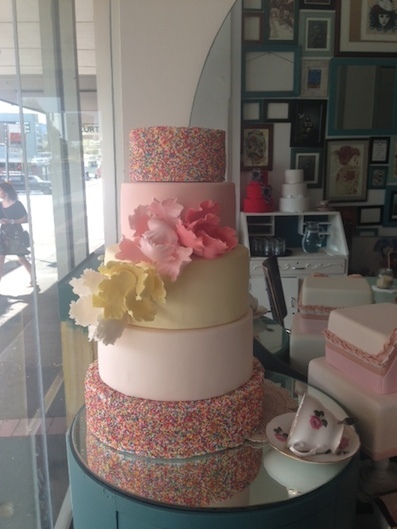 Miss Ladybird Cakes is the perfect spot to order an unforgettable cake or to stop at for morning tea. Cost: Around $4 for a small cake. Please speak to Gina about made to order cake prices. This is fun. It has fused childhood with marriage, making a kind of nostalgia trip about looking back at your past, but looking forward to an exciting future. Plus cake!